Image: Sea ice off the coast of Alaska. Credit: akphotoc/Shutterstock.com. One of the most stark indicators of rising global temperatures has been the rapid decline of Arctic sea ice. For example, since the satellite data record began in 1978, average sea ice extent in September has decreased by around 13% per decade. The pace of ice melt has increased attention on when the Arctic might see its first “ice-free” summer. (By “ice-free”, scientists usually mean a sea ice extent of less than one million square kilometres, rather than zero sea ice cover.) How quickly this arrives will depend on the success of measures to cut global greenhouse gas emissions in order to slow rising temperatures. Climate model simulations suggest an ice-free summer could occur somewhere between 2032 and 2058 under high or medium emissions scenarios. But why does it matter how quickly it happens? And what are the wider implications of melting sea ice? Albedo is a measure of how well a surface reflects sunlight. Snow-covered sea ice has a high albedo and reflects 85% of sunlight. But the open water revealed as ice melts is darker and absorbs more – reflecting just 7%. The less sunlight the Earth’s surface reflects, the more heat the planet absorbs. The heat doesn’t only warm the oceans. Francis explains excess heat entering the oceans during summer is later released back into the atmosphere – raising atmospheric temperatures too. It is one important reason why the Arctic is warming faster than the rest of the planet. In fact, the loss of reflective sea ice is one of the main reasons why Arctic temperature has risen three times faster than the global average in recent decades. This effect, known as “Arctic amplification”, has consequences for nearby land ice, too. As land ice melts, it adds freshwater to the oceans causing sea levels to rise, and surface melt from Greenland is increasing, as the image below shows. Satellite data suggest over the last 20 years, the Greenland ice sheet has lost 140bn tonnes of ice per year. This has raised sea levels by about 7.8 millimetres – 12% of total sea level rise in that time. Climate models project that by 2100, Greenland’s ice sheet could contribute four to nine centimetres to sea level. Earlier estimates had put that figure anywhere between one and 12 centimetres. The quicker sea ice loss causes Arctic temperatures to rise, the faster the Greenland ice sheet is likely to melt – and while it isn’t going to disappear any time soon, this contributes more to sea level rise. Rising Arctic temperatures are thawing once-frozen ground in the Arctic – known as “permafrost”. Scientists are concerned that CO2 and methane released from the carbon-rich permafrost could cause additional warming by adding to greenhouse gases already in the atmosphere – another positive feedback. Frozen methane also exists in methane hydrates in the sea floor. But there is a lot of uncertainty about how much carbon these frozen deposits hold, and how quickly they are thawing. So far, only a small amount of methane in the atmosphere can be traced to thawing permafrost. Most results from human activity, like agriculture and landfill, with a smaller amount released naturally from wetlands. At the moment, warming is mainly driven by CO2 emissions. But the sooner sea ice loss causes land and ocean to warm in the Arctic, the sooner methane from thawing permafrost could start contributing more to warming. Another impact of Arctic and Greenland ice melt could be that the freshwater runoff into the ocean disrupts part of a major circulation system known as the Atlantic Meridional Overturning Circulation (AMOC). 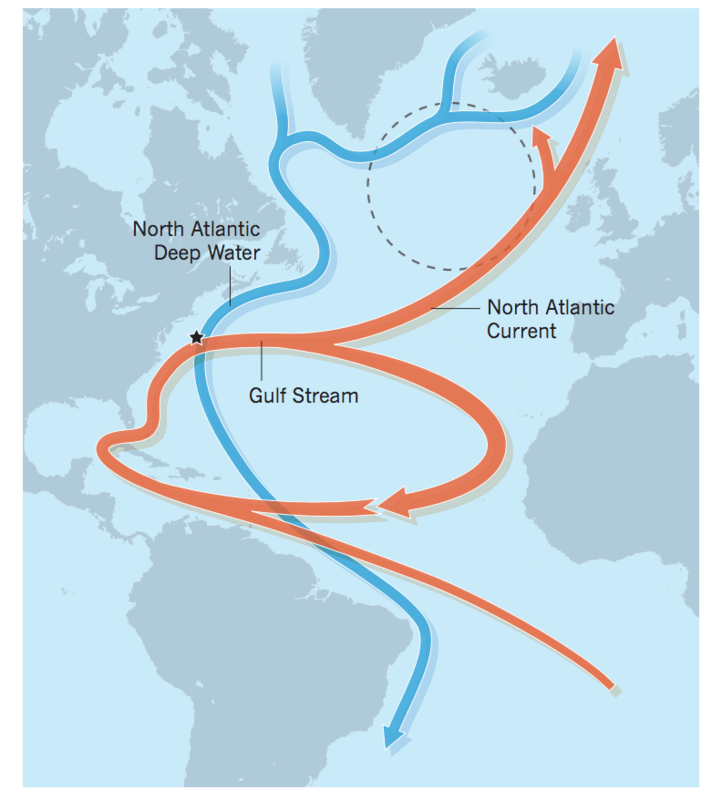 The AMOC carries warm surface water northward from the tropics, giving western Europe its mild climate. Climate models predict the AMOC could slow down by an average of 25% by 2100. This is mainly due to changes in temperature and precipitation patterns, but scientists say freshwater from melting ice could become increasingly important with climate change. Some studies suggest that the AMOC has already weakened by 15% since the middle of the last century. Models suggest a slowdown in the AMOC could cool the northern hemisphere this century, but the effect is likely to be outweighed by greenhouse gas warming. But the AMOC is just one part of a giant conveyor belt which currently redistributes warmth around the world, so losing ice could affect regional climates worldwide. Changes in the strength of the AMOC can also affect sea ice melt by transporting more or less warm surface water into the region. It is a complicated picture and so more research is needed to understand the full extent of the impacts. As temperatures rise faster in the Arctic than at lower latitudes, this changes large-scale temperature and pressure gradients – which may have consequences for extreme weather in the northern hemisphere. The pressure change can also alter atmospheric circulations, including the jet stream – a stream of fast-flowing air high up in the atmosphere. Research suggests that this makes the jet stream’s path meander more, allowing warm air can penetrate north and cold air can plunge south into the mid-latitudes. Larger waves also mean the systems moving from west to east tend to travel more slowly, increasing the likelihood of persistent periods of very cold winter weather or heat extremes in the summer. Melting sea ice is also likely to have global consequences by unlocking new shipping routes and exposing more fossil fuel reserves. But it is clear that although Arctic sea ice only covers a small fraction of the Earth’s surface, there may well be serious climate-related impacts too. “[T]he longer we can delay the loss of sea ice cover, the longer we should be able to keep these consequences at bay”. Why aren't climate models better at predicting Arctic sea ice loss? Arctic | August 8. 2016. Arctic | October 10. 2016. Arctic | August 8. 2013.